The Avengers first appeared in 1963 as a way to sell more comics - and now the team is one of the icons of modern pop culture. Time again for another comic history story. This time, we're going to look at the creation of the Avengers, Marvel's most famous team – and at this point, the most famous superhero team overall. Of course we can't get into the backstory of the creation of every single Avenger, many of those are worthy of their own retrospectives, but we can take a look at the formation of the team and the early changes made to the roster, as well as what it meant for the comic book industry as a whole. Marvel was establishing their own universe, and in doing so they decided to bring it all together into a single team comic book. In the 1960s, the Silver Age of Comics was just picking up speed. DC had a huge success with the Flash, Green Lantern, and the introduction of the Justice League. Meanwhile at Marvel, Stan Lee and Jack Kirby were quickly becoming the face of the industry as a whole, with the very popular Fantastic Four. Over the early half of the decade, Lee and Kirby created characters such as the Hulk, Thor, Ant-Man, and while he wasn't the actual artist for the stories, Kirby designed Iron Man alongside artist Don Heck. The year was 1963 – the previous year, Spider-Man made his first appearance – and each of these characters were catching on with the public. Even with The Incredible Hulk being canceled after issue 6, the character was popular enough that he appeared in Fantastic Four (at the time, Hulk was the only founding Avenger to have a solo series, the others appeared in anthology comics such as Tales of Suspense). Publisher of Marvel, Martin Goodman, and Lee noticed that these characters were selling the most issues, and it only made sense to have another team book that unlike Fantastic Four, was taking solo heroes and bringing them together to sell even more books, similar to what DC had done with the Justice League of America. And so, Stan Lee started working with Jack Kirby once again on a series that would tie their comics together into a shared title. The original team consisted of Iron Man, Thor, Hulk, Ant-Man, and the Wasp. 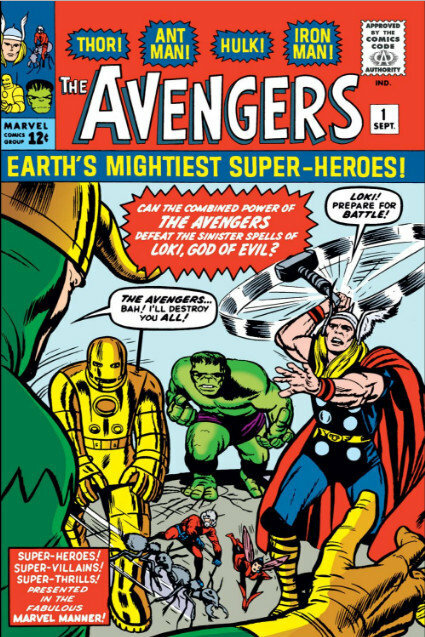 In fall 1963, the first issue of The Avengers was published, instantly becoming a hit. In the story, Incredible Hulk supporting character Rick Jones attempts to contact the Fantastic Four to stop the Hulk, who was being controlled via magic by Loki, from destroying a railroad, but it was accidentally received by Iron Man, Thor, and Ant-Man/Wasp. The team comes together to stop Hulk, and in doing so Hulk joins their side to fight Loki. Wasp gives the team their name, and the rest is history. However, while this team was practically the perfect combination of heroes, the best sellers were always changing and more characters were being created. The very next issue saw Ant-Man take up the mantle of Giant-Man, and one issue later, Hulk left the team – it didn't help that there was no other material/book going focusing on his solo adventures. This left Lee and Kirby with an empty slot for a member, and the two looked into different characters being added. Meanwhile, they had written a Fantastic Four spin-off story about the Human Torch for an issue of Strange Tales, involving a “returned” Captain America – though it was actually a villain that was disguised as the hero to cover up a bank robbery. This story was simply a test to see if the readers wanted to see the Star Spangled Man come back to comics, and the response was highly positive. And so, with Kirby returning to the character he created and Lee writing for the same character that he got his start writing for, Captain America joined the Avengers in #4. Here the story was established that he fell into ice at the end of World War II and was discovered in “present day” (for them it had only been less than twenty years). And from them on, Captain America was considered an “honorary founding member” and the idea that the roster would be ever-changing was set. The concept of a changing team was pretty new to the comic book world, especially where even founding members would leave. While teams like the X-Men and the Justice league would have consistant members and remain relatively unchanged save for adding a few, the Avengers was practically designed to change. Within two years, Iron Man, Thor, and the Ant-Man/Wasp all left the team and were replaced by X-Men characters Quicksilver and Scarlet Witch, as well as Hawkeye. This four-person team is notable for being mostly consisted of former villains – Captain America is the only one who had always been a hero. Over time heroes joined and left, returned for some time, and so on. Surprisngly, Spider-Man wasn't an official Avenger until the 1990s, though he did help out the team from time to time, and vice-versa. As time went on, the roster continued to alter and switch things up, including the introduction of Vision and the return of Iron Man and Thor. The success of The Avengers in 1968 helped to get a solo Iron Man series, and in doing so caused Tales of Suspense to become Captain America after the Iron Man stories were moved to the other title. The team crossed over into practically every Marvel series at the time, from Fantastic Four to X-Men, and appeared in the famous Fantastic Four Annual #3 - featuring the wedding of Mr. Fantastic and the Invisible Woman. Much like Justice League of America, the title expanded and spun out into different series about different teams, such as the West Coast Avengers (as the team was primarily based out of New York City, this would be a team stationed on the Pacific coast) and the comedic Great Lakes Avengers. The team, often referred to as “Earth's Mightiest Heroes,” became a staple of Marvel Comics throughout the Silver and Bronze Age, and like their DC counterpart, pretty much every character has been an Avenger or worked with them. In 2004, a crossover storyline began titled “Avengers: Disassembled,” wherein the team parted ways. However, later in 2005, Marvel introduced New Avengers, a title about a brand-new team of Avengers, including Wolverine, Spider-Man, Luke Cage, and Spider-Woman, as well as classics like Iron Man and Captain America. This team would become the “main” team, replacing The Avengers comic altogether for some time. Storylines such as “Civil War” and “Secret Wars” further divided and changed the team's roster, “Civil War” introducing the Fifty States Initiative, an in-universe plan to put a superhero team in each state (though not all states were accounted for). Eventually the original title was restored, but not for too long. In 2015, the title was once again relaunched with a new name: All-New, All-Different Avengers. Here the team consisted primarily of “legacy heroes” (different characters using names of other heroes) such as Sam Wilson's Captain America, the Jane Foster incarnation of Thor, Miles Morales, the “Ultimate” Spider-Man, and Kamala Khan's Ms. Marvel. This team would change the line-up again and again, with some characters leaving to form their own teams and others stepping out and a new character brought in. The Avengers team is interesting to look at because at any point, the writers can add or remove characters from the team without it being that big of a deal. From the Hulk leaving three issues in to Ant-Man being fired in the 1980s, there's always room to move and change things as they see fit. And it's not a team created as an idea to tie things together, rather to sell more books and expand characters who didn't really have their own series into a separate title people could read. And now, over fifty years later, the comic has become a cultural icon, with several cartoons, video games, and obviously the movies – the third of which is just coming out. 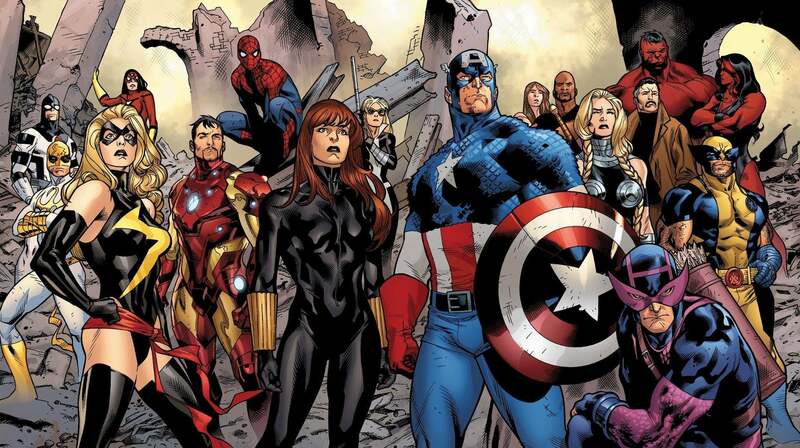 Marvel began their flagship team by changing the heroes that were in it, and continue to do so. The Avengers now likely won't be in ten years. But that now means every generation will have their own team they remember and read. And in the end, that's what matters – carrying these characters and stories across generations.